At ZendCon 2013, Zend announced Apigility which is intended to ease the creation of APIs. Rather nicely, it supports REST and RPC and deal with error handling, versioning & content negotiation for you. Getting started from nothing to create a new API is quite easy: you simply install the Apigility Skeleton Application following the the instructions in the README and then create your new APIs using the admin application. The more interesting case for me is how to use Apigility to supply an API to an existing application, so I’m going to explore how to do this. Let’s start by adding an API to the ZF2 tutorial application. We set the minimum stability and add a new repository and then add some packages to the require and require-dev sections. Once it’s finished, we can update our application. There are a number of things we need to do to update our application to support Apigility. Firstly, we need to add the modules, but some of them are development only and not intended for production. One way to do support this is to provide a separate config/development.config file that is only loaded if it exists and then ensure that this file isn’t deployed to production. As you can see, this simply checks for the presence of development.config.php and merges it. Within Apigility, the DB-Connected functionality relies on ZF2’s Adapter\AbstractServiceFactory, so we need to register this with the Service Manager. The easiest place to do this is in config/autoload/global.php. The simplest API to create with Apigility is a DB-Connected one. In this model, we tell Apigility how to connect to our database and it generates an API for us. 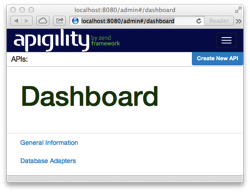 The first part of this to create a database adapter for apigility’s use. Click on the Database Adapters link on the admin dashboard and press the Create New DB Adapter button. And then press the Create Db Adapter button to create our new adapter. We can now create an API, so press the Create New API button in the top right of the admin. Enter AlbumApi into the form field and press the Create API button. This creates version 1 of our API and we now need to create a service. We will create a REST service, so click on the REST Services link and then click the Create New REST Service button. Press the Create DB-Connected REST Service button to create the service. We now need to set our new service up correctly, so click on the AlbumApiV1RestAlbumAlbumEntity link and select the Edit tab. Also, in the REST Parameters section change the Identifier Name from album_id to id. Finally, press the Save button. You can also edit other aspects of your API here. I particularly like that you can choose which HTTP verbs that your API responds to, so to make a read-only API, you could simply uncheck all verbs other than GET. And you should see a nicely formatted list of albums with HAL links. I have created a GitHub repository called zf2-tutorial-apigility which contains the code. The master branch is the fully working DB-connected API and the base tag is at the point before we used the Apigility admin system. Apigility doesn’t seem too hard to integrate into an existing ZF2 application after all. I particularly like that the admin system is development only and the code it creates can be checked into your VCS for easy inspection of what it has done. Obviously a DB-connected resource is a very simply integration, but I’m pleased to see that Apigility has provided an AlbumCollection.php and an AlbumEntity.php file with the AlbumApi module to allow for customisation. Given that Apigility was announced at ZendCon, I’m fairly confident that more work will be done the project and I look forward to new features such as authentication and validation that are sure to be coming soon. Thanks for sharing your Apigility experience with us. Useful/informative!